I have one more craft to squeeze in before Christmas! 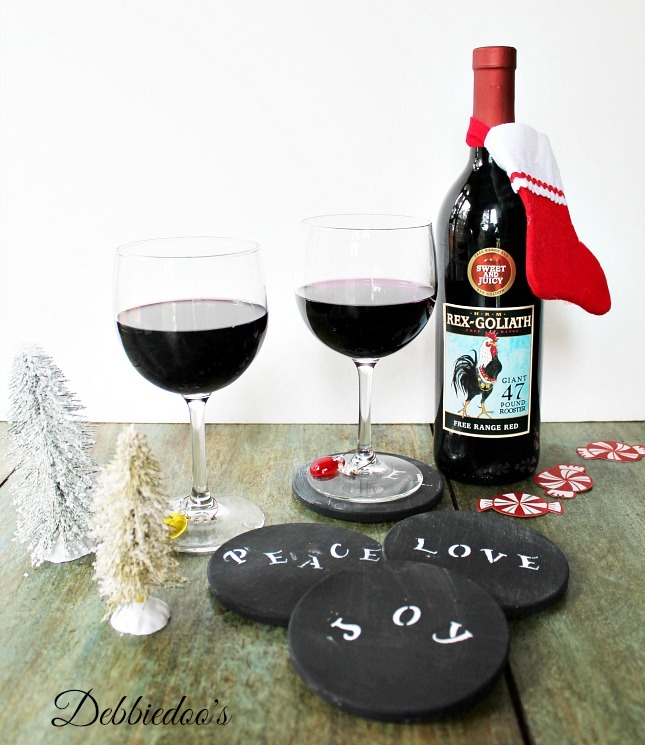 I know this idea of Diy chalk painted holiday coasters has been done a bazillion times. I have to admit I cheated a bit. Instead of hand chalking my words, I stenciled them of course. My handwriting is not the best, so I had to cheat. 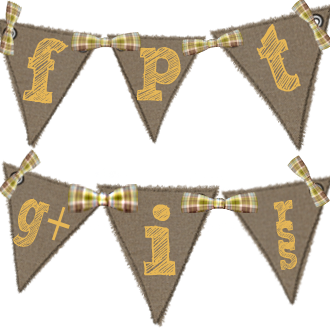 These little peel and stick stencils are wonderful for small projects such as this. I bought the stencil pack at Walmart in the craft section. Did I mention this is a recycle craft as well? I had these bird coasters that I was not using. 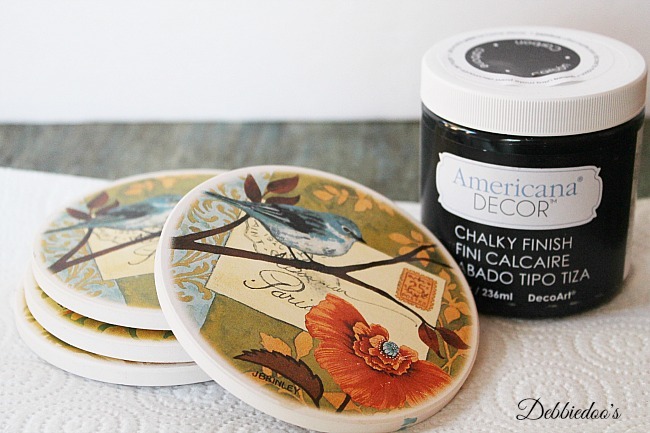 So I thought I would Chalky paint over them with the American deco art chalky paint. 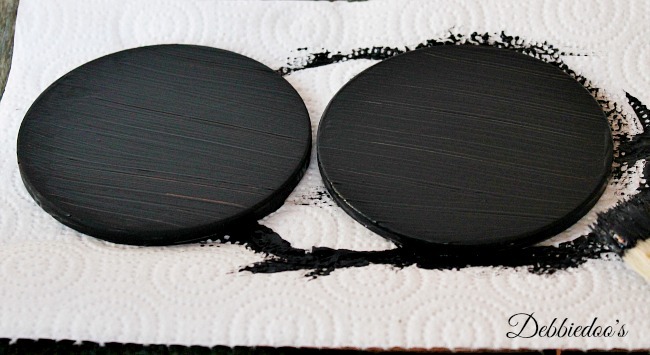 Two coats, letting the first coat completely dry before going on to the second. I think they would make a really cute gift. But I will say, I am keeping them for myself. They look cute on the coffee table, and my boys will use them as well. Thanks for stopping by today. You can follow me around if you like! Great project, Debbie! I like it as a hostess gift, but I also like it as something I would do for myself. Love those little stencils. They look like they would be quite handy for lots of different projects. Love these! One of my faves that you’ve done. Got to pin these! 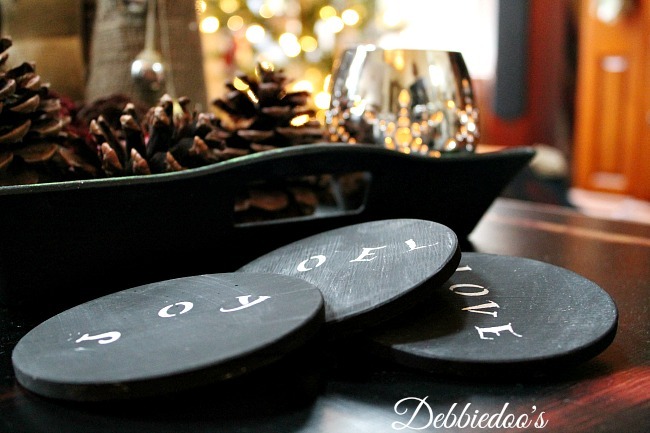 Pretty neat idea Debbie … could even use them for place cards by adding names … handwritten of course. I think you could handle that, bad handwriting and all ? Who is to judge? You come up with some really good ideas. I love them and I have not seen them before, I am going to keep my eyes open for some at the thrift! Just wanted to drop in and wish you my hunky man a Merry Christmas and by the way tell Debbie and the boys I said Merry Christmas to them too LOL! 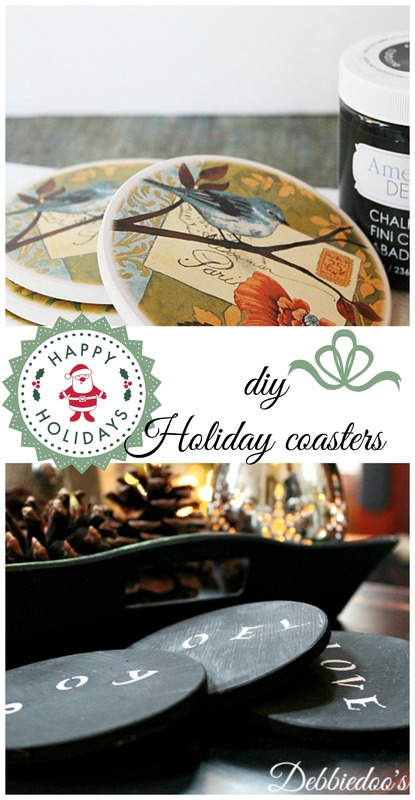 Those are really cute and I have some ugly coasters that would work on. Oh I love this project Debbie! I would use them as place cards for Christmas dinner. 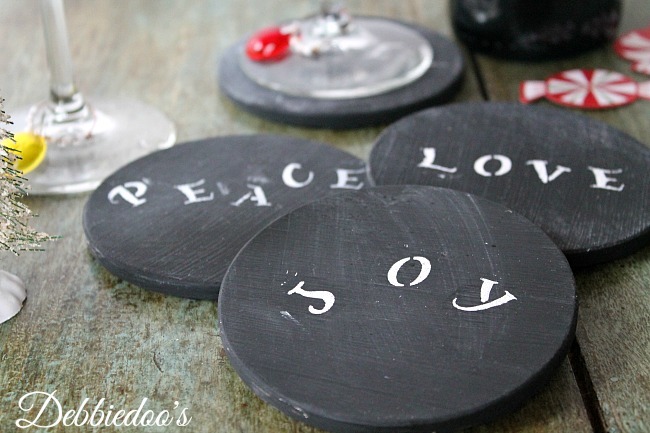 Love that idea…I have some odds and ends coasters that I was going to toss..now I can give them a makeover! Really cute coasters Debbie. Love that you painted the ones you already had. I hope you and your family had a wonderful Christmas and a Happy New Year!